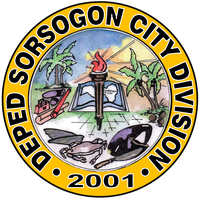 In October 11, 2001, with the strength of RA8806—an act creating the City of Sorsogon by merging the municipalities of Bacon and Sorsogon—the Sorsogon City Division started charting its own history. Through a memorandum, Dr. Virgilio S. Real, ES I for TLE, was assigned by Dr. Dominador Osea, the Schools Division Superintendent of Sorsogon, to prepare the documents needed to facilitate the processing and approval of the establishment of the Division of City Schools in Sorsogon City. In consequence, DepED Secretary Raul S. Roco issued a memorandum on November 16, 2001 establishing the Division of City Schools. Dr. Adelina Z. Cadag was designated as OIC-ASDS on December 4, 2001. The former office of the Sangguniang Bayan of Bacon was occupied as the division office. In May 2002, Dr. Adelina Z. Cadag was reassigned as SDS of the province division. Dr. Virgilio S. Real took over as OIC-ASDS. In March 2003, Mrs. Emma I. Cornejo sat as the new OIC-SDS. The division personnel held office at Sorsogon National High School. In 2004, she was appointed as Schools Division Superintendent. When Mrs. Cornejo was reassigned to Camarines Sur in 2005, Dr. Virgilio S. Real took her place as OIC-ASDS. In 2006, all Education Supervisor I designates were given approved appointments and was attested full-fledged ES I by the Civil Service Commission. In 2007, Dr. Virgilio S. Real submitted a request for a new site to City Mayor Leovic R. Dioneda. As the request is granted, a SARO for the construction of the division office building was released. A ground breaking ceremony was held at the new division office site on December 17, 2007. On July 15, 2008, Dr. Virgilio S. Real was appointed Schools Division Superintendent. The new division office was inaugurated and blessed on December 8, 2008. In 2009, Mr. Wilfredo J. Gavarra was designated as EPS II at the DepED Regional Office. Consequently, Dr. Nympha D. Guemo assumed as the Assistant to the SDS. The multipurpose building was constructed in 2010. In 2011, the city division celebrated its first decade with notable accomplishments and achievement. It banners its name in national and regional competitions, performed well in the NAT and RAT. Its people have made names and remarkable recognition in various fields of academic endeavor.